Image by JelleS via FlickrMaking a Geocaching-Tour for several days off the road? Or just hiking/trekking and want a good, hot meal or coffee? This is for you. 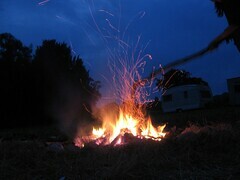 Lifehacker.com has a great article on how to make a proper, effective fire in the wild, outdoors and indoors. If you're experienced in outdoor survival or living, this might look very basic to you. But there is a good reason for everyone to know them. You will make a fire more quickly and effective, and, much important, safe. A lot of fires really went very wrong with dramatic consequences for the environment (or the person), only because people don't know the basics of making a safe fire. I'll add the video here. Make sure to check the full article at Lifehacker.com, to see more videos and information about making fire, and what you need to know for indoor fires.